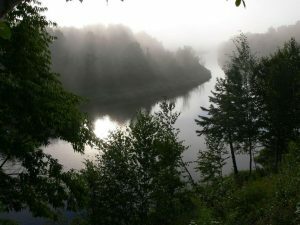 In ancient times our ancestors established a village where the Little Southwest and the Northwest Miramichi River meet. The village was called Metepenagiag and here, for nearly 3000 years, generation after generation flourished. The river provided an abundance of fish while the forests offered shelter and many other necessities of life. We invite you to visit and experience our aboriginal culture here in Metepenagiag. The involvement of our elders, a renewed spirituality and our nationally recognized heritage sites (the Oxbow and the Augustine Mound), have combined to awaken our past, to rekindle our cultural pride and to offer hope to our future generations. Our hospitality and our lodge is a symbol of what we can accomplish as a people. We at Red Bank First Nation invite you to sample our rich cultural heritage. Metepenagiag – tjitjagamitj eimootltjig – Where Spirits Live, brings you in touch with this unique place and a special people. Come sit down and relax in our lodge and view our award winning movie” The Village of Thirty Centuries.” Various art work from local crafters is made available throughout the lodge for our guests to admire. We’re located in the comfortable confines of the Metepenagiag Outdoor Adventure Lodge and staffed by nationally certified interpreters who will be delighted to tell the story of Metepenagiag. At the end of your tour relax and we’ll share refreshments.